Jane Wilhelms, professor of computer science and an expert in computer graphics and animation, died of cancer on March 26 in Santa Cruz. She was 56. Wilhelms began her career as a biologist, teaching anatomy and physiology for many years at junior colleges before returning to school in computer science. 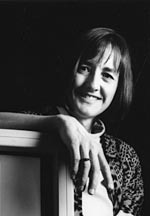 Much of her work in computer graphics, including techniques for animal modeling and animation, drew on her background in biology. Wilhelms joined the UCSC faculty in 1985, immediately after completing her M.S. and Ph.D. in computer science at UC Berkeley. She earned her B.A. in zoology at the University of Wisconsin-Madison, and an M.A. in biology at Stanford University. Her experience in computer graphics and animation included working as a consultant programmer at Lucasfilm, where the Star Wars movies were produced, while she was a graduate student at UC Berkeley. The use of computer graphics to help other scientists visualize their data was an area in which Wilhelms made significant contributions at UCSC, serving as project director of the UCSC Scientific Visualization Laboratory. The laboratory, used by faculty in the Baskin School of Engineering and the Division of Physical and Biological Sciences, was established with a grant from the National Science Foundation in 1997 and received additional funding from the NASA Ames Research Center. A memorial service will be held April 14 in Fond du Lac, Wisconsin, where Wilhelms was born. In lieu of flowers, donations may be made in Wilhelms's memory to the United Pegasus Foundation, a California horse rescue organization. Checks made payable to "United Pegasus Foundation" may be sent to Wilhelms's sister, Janet Cutler, P.O. Box 5261, De Pere, WI 54115.